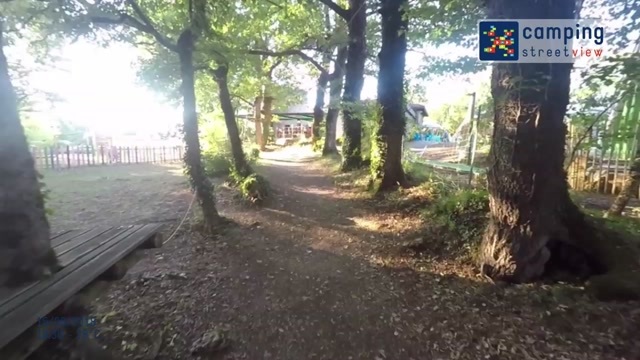 In Villefranche-de-Rouergue in Aveyron, campsite Le Lac aux Oiseaux lies by the Bannac lake. A tyrolean crossing over the lake is also possible and you will find a covered swimming pool for the whole family and a minigolf onsite. A spacious tent equipped with micro-wave, fridge, gas hob, a boiler, blankets and nice furnitures settled on a location without any opposite. Ready for your arrival ! this is a tent to rent with a mattress on the floor and the camping equipment. Live in nature ! Santaries equipment are new. A pitch without electricity, showers and toilets are new ! For a motorhome ! your place from 6p.m. till 10a.m. The Funflower is a canvas bungalow, shaped just like a big top, sets up on a wooden floor with a small covered terrace. Without sanitary but equipped of a kitchen area with gas fires, fridge, you will find dishes and blankets and pillows. The Camping with the comfort of an apartment...Two separated bedrooms, a living-room, a bathroom area with a shower and a washbasin. Two production model are existing : one with a wooden structure from its outside and the other one in white with sun visors at its windows. You will find a wooden terrace and garden furniture. Year of service : 0 to 7 years old. A 28 m² mobil-home, well equipped for 4 persons with two bedrooms and the possibility of putting a baby bed in the parental bedroom. You will find a fully covered terrace and a big pitch, even with your car parked. This Mobile Home, our lowest price rental can welcome a 4 to 6 persons family. : A large living-room with a sofa bed and two bedrooms (one with two small beds / the other one with a parental bed). Three bedrooms in the mobile home, living room, kitchen area, fridge, bathrooms, toilets, dishes, blankets and pillows, nice terrace 18 m ² covered by a canvas. Three bedrooms with separate beds, living room, kitchen area, fridge, bathroom, toilets, dishes, blankets and pillows, big and nice terrace, with garden furniture. A 28 m2 mobil-home, well equipped for 4 persons with two bedrooms and the possibility of putting a baby bed in the parental bedroom. You will find a semi covered terrace of 6 m ².
il manquait un peu d'ombre mais d'autre emplacement était plus à l'ombre. Emplacement assez grand proche des sanitaires, snack et piscine. Mobilhomme en plein soleil, pas d'ombre du tout. Contrairement à ce qui était indiqué pas de wifi ou quasiment pas sur l'emplacement alors que sur le site il était indiqué "wifi sur tout le camping", c'était l'un des critères qui nous ont fait choisir ce camping. Pas de wifi avec un ado, c'était compliqué ! très bien équipé, beaucoup de rangement. La connexion wifi était pour ainsi dire inexistante, je n'ai pas pu travailler sur les dossiers prévus. L'équipe d'animateurs était sympathique et disponible. L'ambiance était plutôt familiale et très agréable. Le camping est calme. Le cadre est vraiment agréable.